A low FODMAP diet can be complex and boring if you are not sure about the right foods to eat. This salad is worlds away from bland and boring - vibrant, colourful and zesty, it combines Eastern flavours like ginger, soy and sesame with tangy and sweet mandarin pieces. Rice vermicelli noodles absorb flavours well and add to the eastern feel of the dish, not to mention that they will satisfy any appetite! The contrast between the greens of the spring onions and salad leaves and oranges of the mandarins and carrots really brings this dish alive. If you are planning to cook this dish bear in mind you should marinate the chicken to absorb maximum flavour, so I'd suggest that you prepare it before you head to work or even the night before and leave to marinate (covered) in the fridge. If you love a bit of heat, you could also add fresh red or green chilli to this dish for a truly Eastern vibe. Succulent and tender chicken pieces, herbs, spices, lettuce, vegetables and even fruit make this healthy meal a guaranteed winner for lunch with the girls, or even dinner with the family. Mix together the soy sauce, sesame oil and ginger in a large dish. Add the chicken pieces, cover and marinate in the fridge for several hours or even overnight. Grill the chicken until cooked thoroughly (5-6 minutes per side until the internal temperature hits 160c) and slice into thin strips when cool enough to handle. Place the noodles in a pan of boiling water, season with salt and allow to cook according to the packet instructions. Drain and rinse in cold water and set aside to cool. Put the lettuce, celery, spring onions and grated carrots into a large bowl and toss to combine. Distribute the mandarin oranges and chicken over the salad..
Pour 2 teaspoons each of soy sauce and sesame oil over the noodles (not from the chicken marinade, use fresh ingredients...). 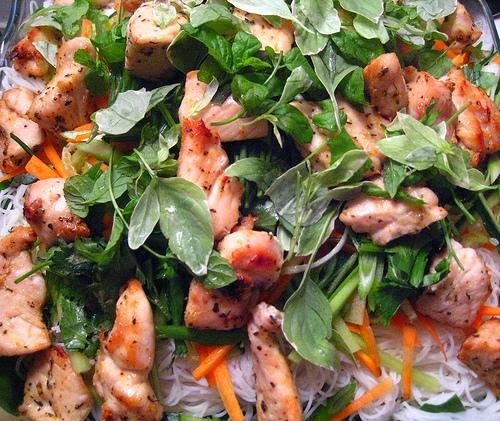 Top with the toasted sesame seeds and arrange the dressed noodles in the middle of the salad. Drizzle with your favourite dressing and enjoy! Food and health optimisation experts YorkTest, can help you find out if you have a food intolerance or by taking a simple test.